While suffering through one of my fabric acquisition outings for non-Caitlyn-related projects, Caitlyn picked out this blue fabric. I thought it was sweet, so I picked a pink for contrast and planned to make her a skirt. I really need to think things through before I start them. 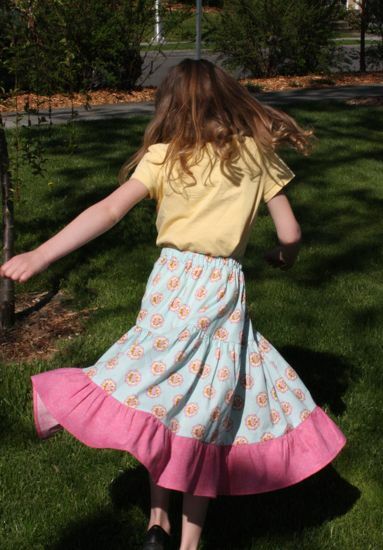 I had a simple skirt-with-flounce in mind when I bought the fabric. 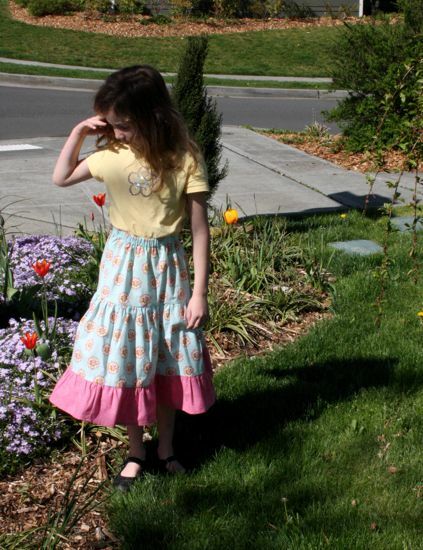 That shifted to a tiered spin-able skirt when I started measuring and cutting. And when it was all done, I realized that what I wanted to have done was more like an a-line. It's not that it's a bad skirt or even an unattractive one. I think I bought 1 yard of the blue fabric, which didn't work out to feeling like quite enough. It's just not as full as I'd like at the waist. And the single tier is a little weird. I should have stayed with the original, non-tiered plan. I think that would have worked out to being 16 inches of blue length (cut the yard length in half, remember to save a few inches for the waistband). Maybe I didn't have enough of the pink to make a 4 inch ruffle (I'm aiming to make 20 inch skirts for Caitlyn these days - maximize the growing room), but a simple contrast band without the ruffle would have worked. Less about the volume or the speed of the turn-around. A little bit more about the Making a Solid Plan.